Our last few days in Japan were each dedicated to a single purpose. The first was a day of leisure (or, at least, that was the plan). The second was less about the usual monks-and-temples and more about mice-and-castles. 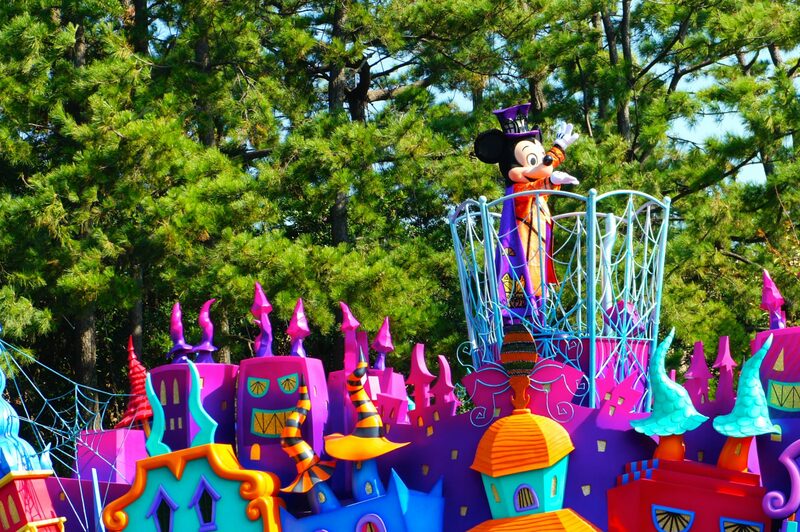 That’s right — we were off to Tokyo Disneyland! The third, and last, was all about Kat’s birthday. You may have noticed that people the world over celebrate this late-October event by dressing up in elaborate costumes and begging strangers for candy, two of Kat’s favourite pastimes. But we’ll get there. The first day began with a leisurely breakfast consumed en-route as we wandered from the hostel to the metro. 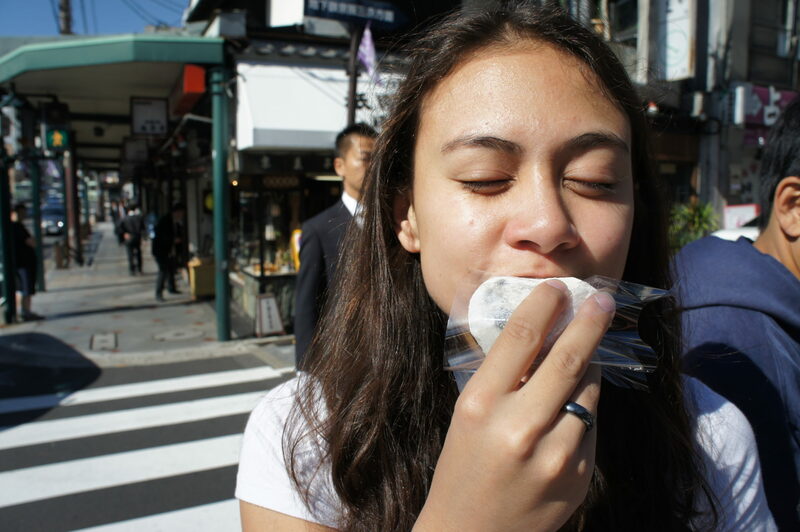 We took our time picking out some mochi (a kind of sticky rice cake) and dropping off Amelia’s kimono. Green tea mochi: breakfast for the discerning traveler. As it turns out, this was not an effective use of our time. We missed the 11:30am train to Tokyo, and had to wait ’till just past noon to catch the next train out. Of course, Shawn’s flight back was not waiting for us to sort out our train schedules, which put us in a difficult position, since Shawn very much wanted to return home. What followed was a mad dash through the Tokyo metro system. This was somewhat frustrated by our inability to understand the labyrinthine Tokyo subway map, so we split up in search of assistance. 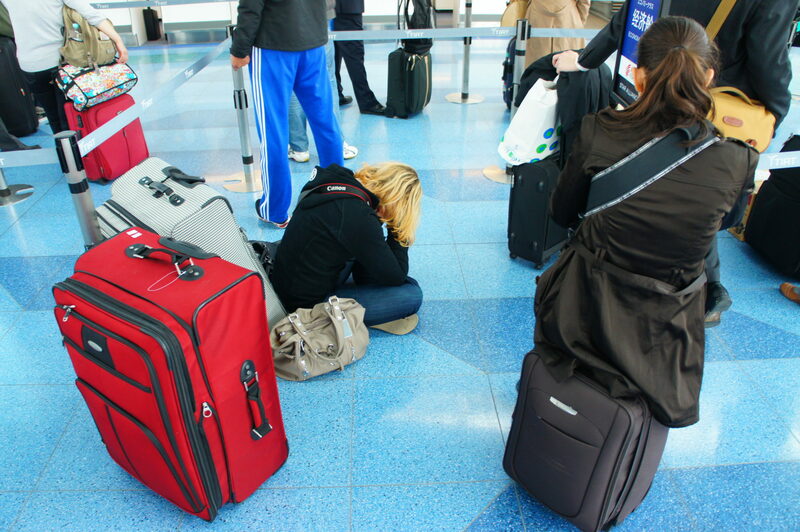 Foolishly, Shawn was in one group and his luggage was with Amelia, across the station. This worked out about as well as you’d expect. To cut things short, the climax of the scene involved Amelia running, in heels, with luggage in tow across a lengthy subway platform. Meanwhile, Shawn stood in a train car, praying for the doors to stay open just long enough for Amelia to get there. Thankfully, she got the luggage across the car’s threshold just in time, and Shawn (barely) made it on to his flight. We made our way to our hostel, exhausted and happy to laze about in bed. We spent the rest of the day in our rooms, got plenty of sleep, and headed off for Disneyland in the morning (on time, for once!). We took a quick detour past a local shrine and through a street market, but did not linger. Just a lazy Sunday morning street market in downtown Tokyo. We passed by Sensouji temple. It wasn’t long before we made it to Tokyo Disney. 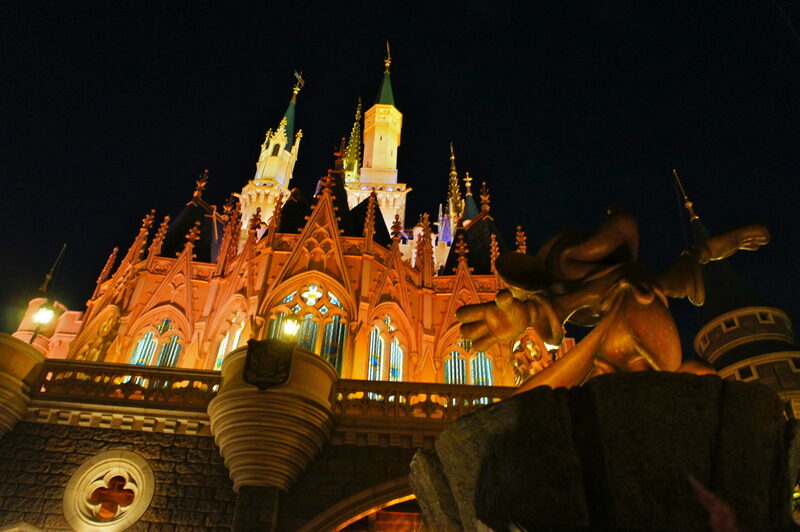 Now, Tokyo Disney is a huge resort that’s split into two parts: Tokyo Disneyland and Tokyo Disneysea. 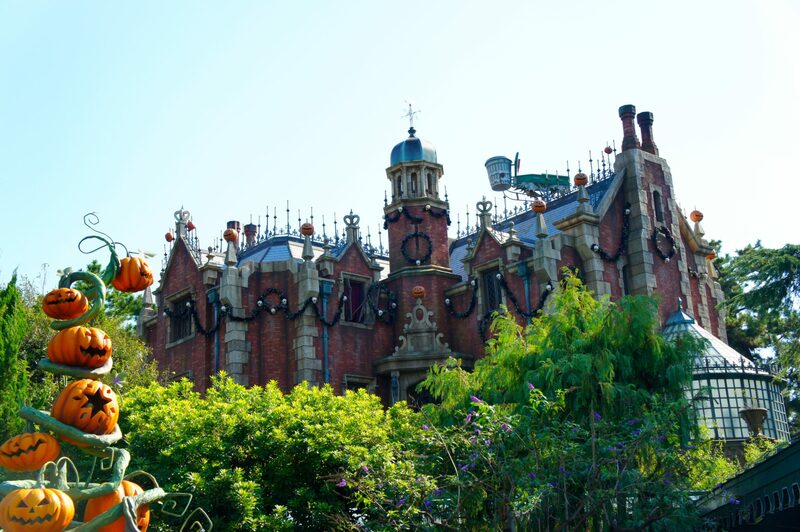 We hadn’t realized this before our arrival, and for a brief and shining moment we were excited for the chance to tear through two totally different Disney parks. Unfortunately, the attendant informed us that each park was a whole-day affair, and that the discounted admission two-pack only applied to visits on separate days. If we were really committed, we could race through Disneyland and try to tackle Disneysea in the evening, but we’d need to buy separate tickets at full price. We held off on making a decision until later in the day, and started out with Disneyland. We were excited long even before entering the resort. The ladies were greeted by an emissary from the great land of Mouse. City Hall was decked out for Kat’s birthday celebrations. We meandered past City Hall and through the World Bazaar (Tokyo Disneyland’s version of Main Street, USA) and found ourselves at Tomorrowland. 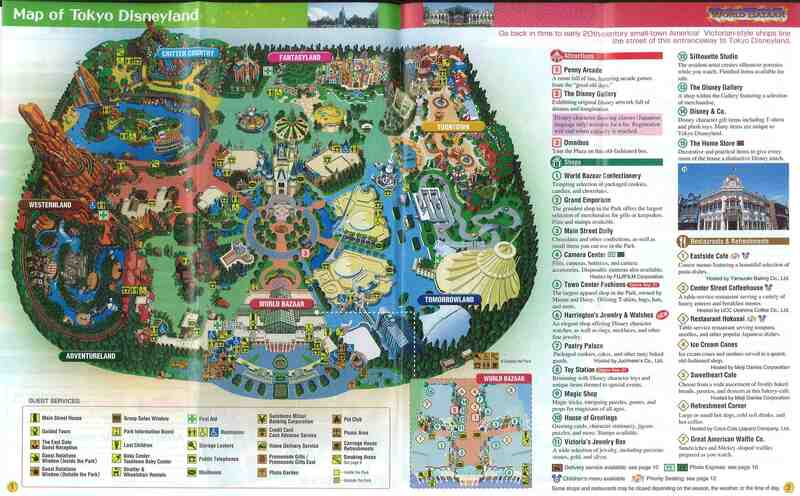 The plan was to explore the park in a counter-clockwise path; this map might help you follow along at home. 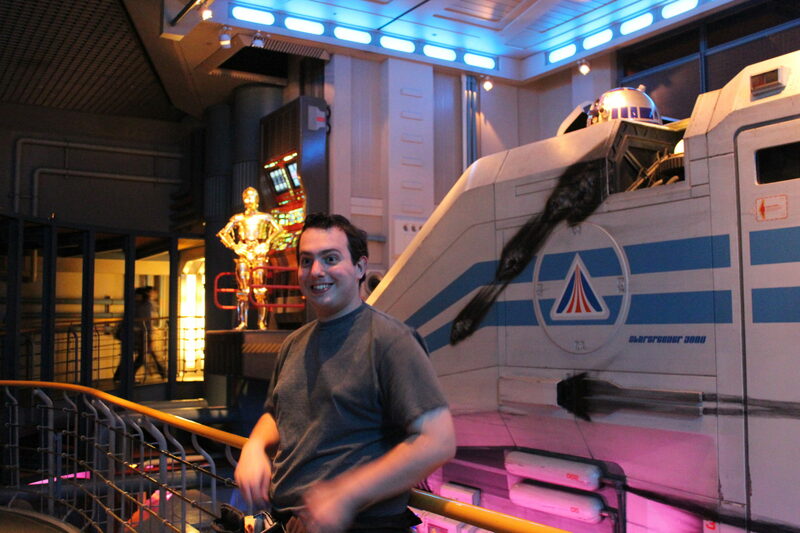 Our first ride was a very special one for me: Star Tours! When I first visited Disneyworld as a wee lad, I rode the Star Tours ride dozens of times with my brothers. I hadn’t realized that Tokyo Disneyland would have the same ride, so I was very excited to discover that I could relive the magic. I am happy to report that the ride did not disappoint. By the time I finished up at the post-tour droid and baggage claim (sadly, no landspeeder rental today), Amelia was feeling peckish. We’d already visited most of Tomorrowland’s rides at Disneyland Hong Kong, so this seemed as good a time as any to head out in search of food. We set out on a quest for sustenance, but quickly found that we were roadblocked by Disneyland’s favourite rodent. I’m no expert, but I’d say that Mickey’s mousetrap is unusually humane. We had stumbled upon one of Disneyland’s daily parades. There was a whole lot of singing and dancing and rollerblading fairies, so it’s no surprise that there are literally thousands of recordings of the parade online. I did not join in — not because I did not want to, but because I already had a video of a similar parade in Hong Kong. After the parade we found a food vendor. Amelia was thrilled to find that this magical resort served mouse-shaped pizza, which shouldn’t have come as a surprise but, well, it did. 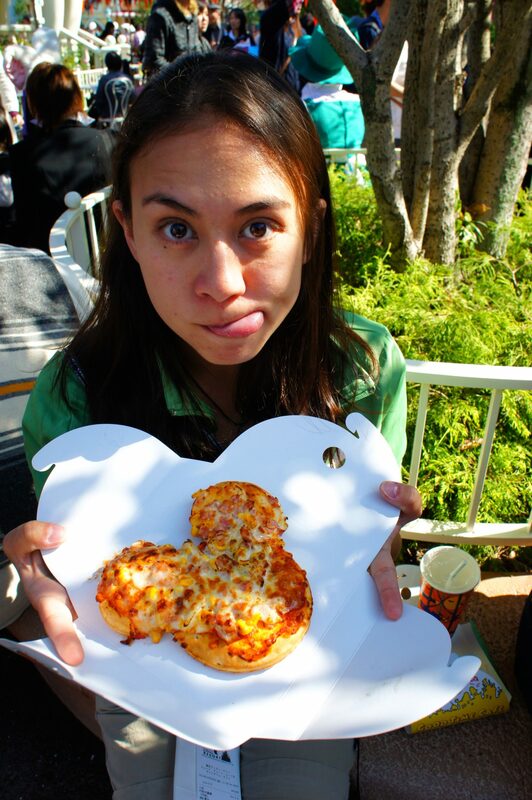 Amelia’s treatment of this mouse-shaped pizza was less than humane. We sauntered from the pop-up pizzeria towards a Who Framed Roger Rabbit-themed area of the park. The classic rabbit-themed live action/animated feature is one of Amelia’s all-time favourite movies, so it was a real treat to have a chance to visit Toontown. Unfortunately, Toontown was a bit of a letdown. It is essentially the babysitting corner of the park, full of change stations and jungle gyms and sundry other sorts of things for which the very young go ape but the merely young-at-heart have less use. There were also a number of non-Roger-Rabbit-related walk-though “houses” (Mickey’s House, Minnie’s House, Chip & Dale’s Treehouse, etc.) where the cartoon-obsessed could experience their heroes’ living conditions first-hand. Still, there is one ride set in the Roger Rabbit universe, for which Amelia was very excited. Unfortunately, we weren’t the only one who were excited. The lineup was long and winding, so we resolved to return later in the day. Amelia was contractually obligated to break out into a song and dance number. We spent some time winding our way through the park. We saw a whole bunch of cosplayers (I’ve grouped those photos together later on in this post), and eventually found ourselves at the Haunted House. It’s pretty hard to be creepy on a bright day like this. The lineup at the Haunted House was deceptive. We saw a brief line leading into an archway, but what we didn’t see was a winding, slow-moving mass of people waiting in the gardens just past the archway. Once we got there, we were already committed. We ended up standing in line for almost an hour and a half. We did eventually make it in, and were glad that we did — the Haunted House is a blast. We don’t have any photos worth sharing, though, since it was spookily dark inside. 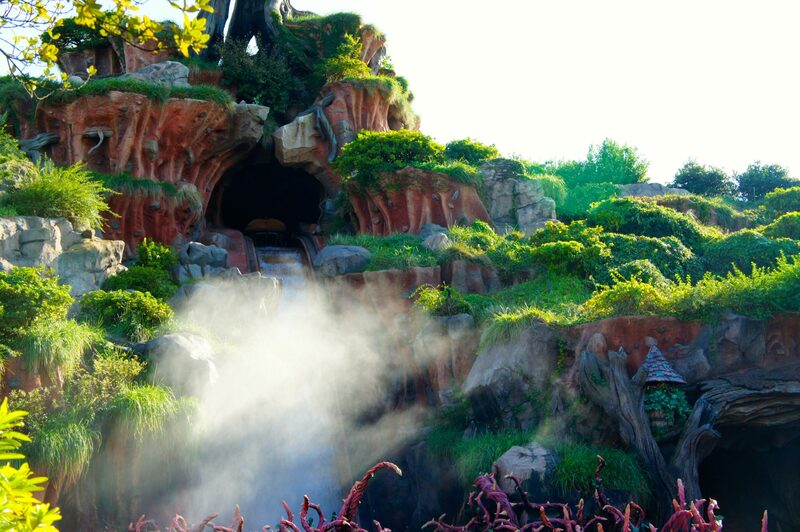 Let’s skip ahead to the next ride: Splash Mountain! Splash Mountain is probably the most popular ride in the park. The line stretched on for ages, and we had zero interest in long lines. We were just about to skip this highly-anticipated ride when I noticed an advisory sign mentioning a second line. It turned out to be a single rider line — riders who weren’t part of a group could jump in to round out odd-numbered groups. We’d been stuck together for a few months by this point, so we were A-OK with parting ways for a few minutes to hop on without a wait. We took that ride three or four times in quick succession (I can’t remember the precise number — it’s all a vertigo-inducing, water-soaked blur now). Not pictured: The terrified screams emanating from the falls. The first ride seemed a little awkward for my companions at first — I was seated with a group of three ladies, who were visibly uncomfortable to have a big foreign dude seated with them. They got over it after I got my first face-full of water; being nearly a foot taller than my seat mates made me an easy target for errant splashes. 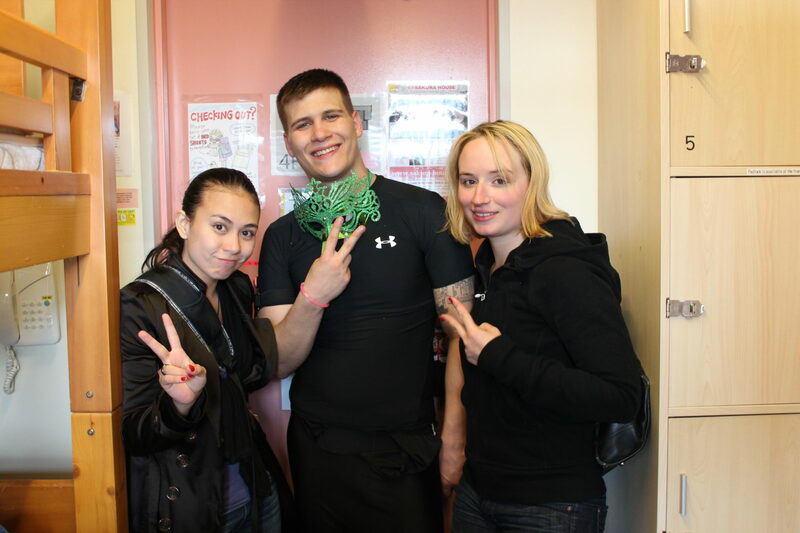 Pretty soon they were asking me where I was from and sharing their appreciation of Canada in halting English. In retrospect, that was a lot of progress for a five-minute ride. Anyways, I don’t recall the other trips through the falls being as awkward. After a few speedy trips through Splash Mountain, we headed off in the direction of the central plaza, presided over by Sleeping Beauty’s Castle. We soon arrived at the Neuschwanstein knock-off, which was a picture-perfect in the way that only the Disney Corporation can manage. Walt’s got a nice place. Having Amelia around made it harder to focus on the castle. The killer feature of the plaza is not the castle, however. The best part of the plaza — nay, of Tokyo Disneyland — is its endless supply of cosplayers. 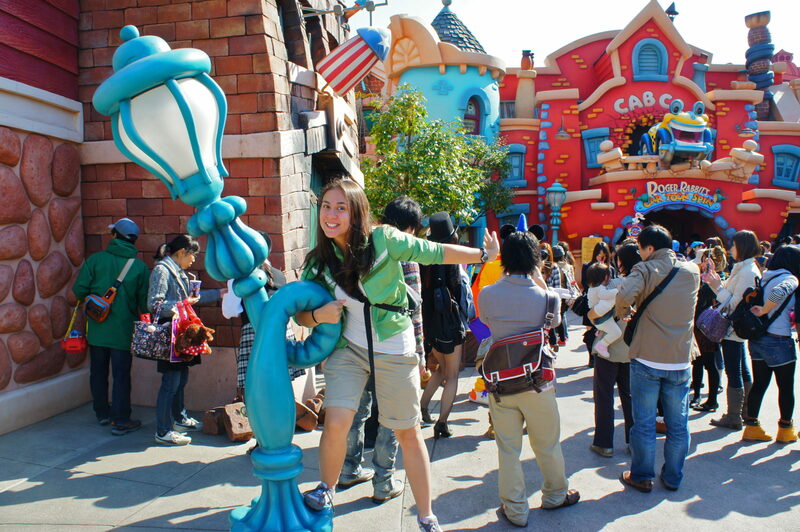 We had seen a few people in costume at Hong Kong’s Disneyland, but Tokyo’s park visitors took it up a notch. We’d been seeing them all day, of course, but the lion’s share were clustered in the plaza. It’s official: Japan is the place to go for top-notch cosplay, and Disneyland is a year-round cosplaying festival. For your gawking pleasure, I have grouped most of the cosplayer photos we took right here (including some from earlier in the day). I’m not sure who the pink lady in the middle is supposed to be, but the girl to her right has a really convincing Amelia getup. Based on the black shirt, I guess this makes Kat the wicked stepmother. I guess Minnie Mouse is too cool for the two-finger salute. Beauty, the Beast, and the Foreign Interloper. I’ll be honest, I don’t know what’s going on here. Amelia’s long-standing fear of facial hair really added to the verisimilitude here. Kat was eager to get her princess on. Amelia was in more of a swashbuckling/world-saving mood. Wait, who let the toons hold the Dip? 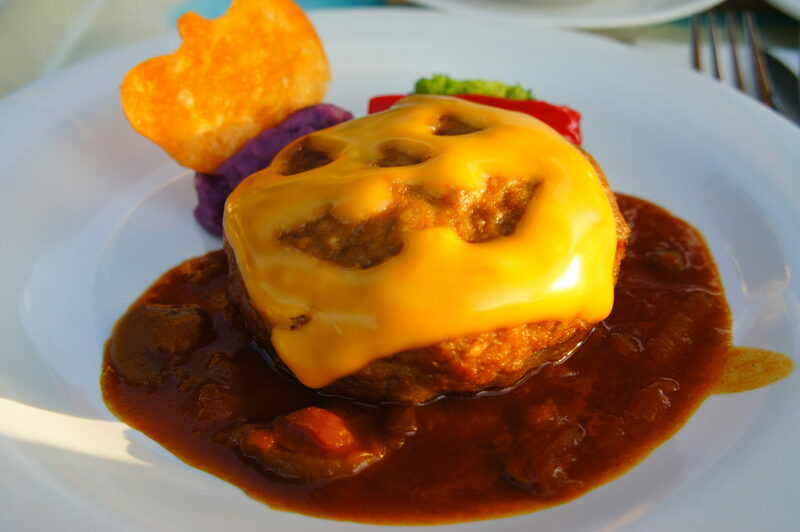 This burger patty was frightfully good. We headed over to Adventureland, which was a delightful Hawaii/New Orleans mash-up, home to treehouses, railroads, and jungle cruises. 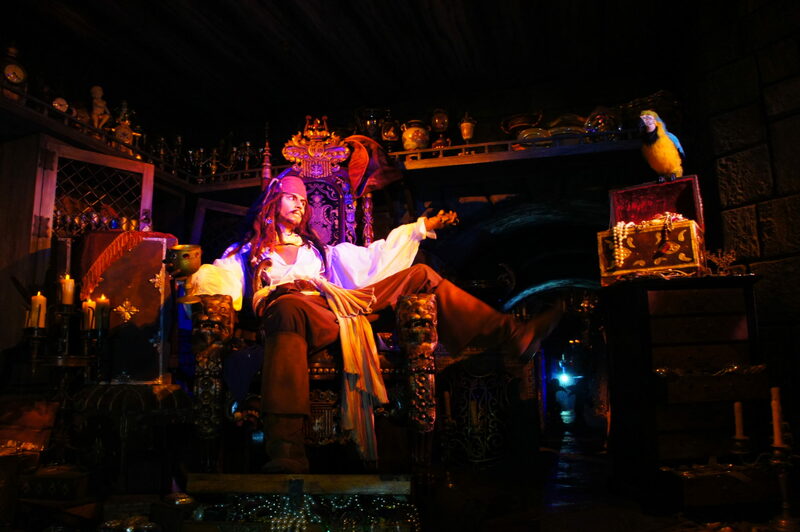 One of our first stops was at the Pirates of the Caribbean ride. The ride has undergone a number of changes since its first run. For example, at one point a group of animatronic pirates chased around a group of animatronic maidens. The, uh, non-consentual flavour of this scene was counterbalanced in the next (more recent) scene, where a group of animatronic ladies returned the favour. I’m not sure that that makes it much better, but at least they tried. He is, without doubt, the worst pirate I’ve ever heard of. After touring the scenery in Adventureland, we made our way to Westernland, home of rocky outcroppings, kid-friendly saloons and a pretty sweet steamboat. We visited the local attractions, chief of which was the aforementioned steamboat. It lazily shuffled across the placid waterway, giving us a brief respite from walking and a chance to survey the scenery. Amelia is scared of water, so she had the steamboat willies. We also had a chance to witness singing and dancing bears at the Country Bear Jamboree and poked our heads into a shooting (sorry: shootin’) gallery. 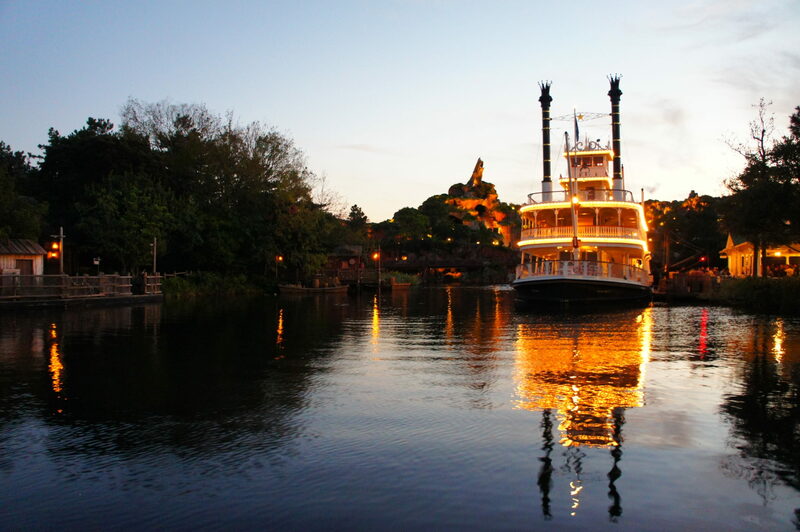 We considered hopping on to the Big Thunder Mountain roller coaster, but a number of factors conspired against us: the ride had a long line, there was no single-rider fast-lane, and dusk was beginning to fall. We aren’t opposed to riding the rails in twilight, but sunset signals the start of Disneyland’s evening entertainment in the plaza. 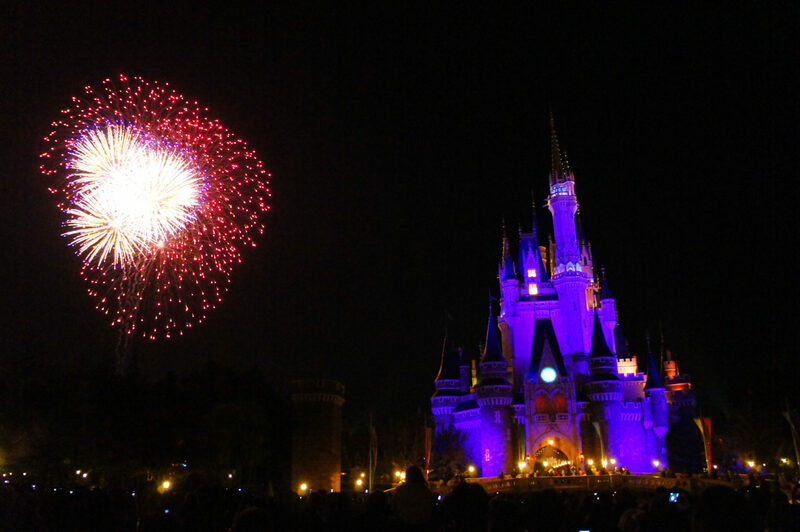 We didn’t want to miss out on the nightly fireworks, light show, or parade, so we hastened back to the centre of the park. We made it back in plenty of time, so we headed up the castle ramparts, now newly bathed in light. All it needs to complete the look is a vengeful dragon or two. We spotted a handful more cosplayers lingering in the plaza, so we took the chance to get a few last snaps in. I’m not really sure who any of these characters are, but Amelia was pleased to meet them. This was the only Jasmine cosplayer that we came across, which is a shame — Jasmine is pretty boss. It wasn’t long before the evening’s entertainment began. 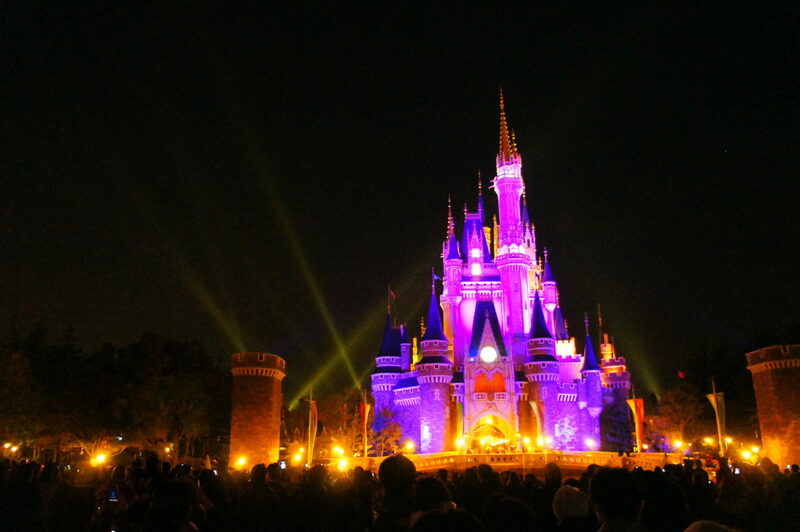 First up was the Tokyo Disneyland Electrical Parade, a dazzling display of lights mounted on motorized floats, dancing characters, and the occasional fairy godmother. I don’t know whether this high-tech procession is a standard feature at Disneylands the world over, but it felt like a very Japanese spin on the classic Disneyland parade. Sleeping Beauty is sort of over the whole sleeping-at-night thing, I guess. I know that we’d just been on a steamboat, but we hadn’t grown tired of them. The parade eventually passed, leaving us with ample time to find a place to lay on the cobblestones of the plaza. We made a beeline for a pretty good spot by the castle, managing to stake our claim before the area filled with aspiring sky gazers. We lay on the ground, oohing and ahhing at the ramparts’ changing colours. The atmosphere was quiet, contemplative even. We spent half an hour laying on the cobblestones, surrounded by a sea of similarly-recumbent park-goers. It was a peaceful island of time in an ocean of hectic sightseeing. We waited, without urgency, for the next display. I, uh, guess you had to be there. We performed the usual firework-observing rites (to wit: we oohed and ahhed in time to the bursts, cameras at the ready). Being as we’d already seen a similar display in Hong Kong, we took it easy on the photo-documenting; it was quite relaxing to recline in the evening air and take the spectacle in. Before long, it was over. We only had a short time left before the park wound down for the day, so we made good on our earlier vow and returned to Toontown. With the lines now dissipated, we all piled in to Roger Rabbit’s Car Toon Spin, where we experienced abduction, intrigue, and general chaos. We were very nearly Dipped, but fortunately escaped through a portable hole at the last moment (in true cartoon fashion!). Amelia was delighted. Amelia encounters the infamous Dip and is suitably afeared. Yeah, I can see how that would be hazardous. Our ride-going was at an end, as the park was beginning to shut down. The shutdown process happens in stages, with far-flung attractions such as Toontown closing first. We made our way to the World Bazaar (subtitle: “Totally not Main Street, USA”) where we partook of Disneyland’s finest refreshments. Amelia could not get enough of this stuff. I found the foot-long hotdog of my dreams. And, with that, our day at Disneyland was at an end. We left the park and took the metro back to our hostel. The next day would be our last full day in Tokyo — our flight out was scheduled for the following morning. The evening would bring Kat’s birthday festivities, so we spent the morning in relative leisure. After a pleasant and hearty breakfast, we visited a nearby temple (Sensouji), where we drew our fortunes. I’m not totally sure where these doors lead, but they look cool. The ornate underside to an already-pretty-ornate bell. The fortunes are called omikuji. The faithful (or, like, tourists or whatever) pray for a wish while politely shaking a slotted box. I’m not making that up — the instructions, posted by the box, specifically note that shaking should be polite. The box doesn’t actually dispense fortunes, though. A numbered stick falls out of the box, and the recipient takes a fortune sheet out of a like-numbered drawer nearby. After returning the stick, of course — the instructions are very clear about this. They are also clear that people should “tenaciously do [their] best” and that we can all “carve out [our] own fortune”, which is a remarkably non-deterministic view for a fortune-telling shrine. The temple was not far from the open-air market that we had seen the previous day, so we toured that for a while before returning to our hostel. We stayed in for a while, resting up after our long and hectic trip through Japan. 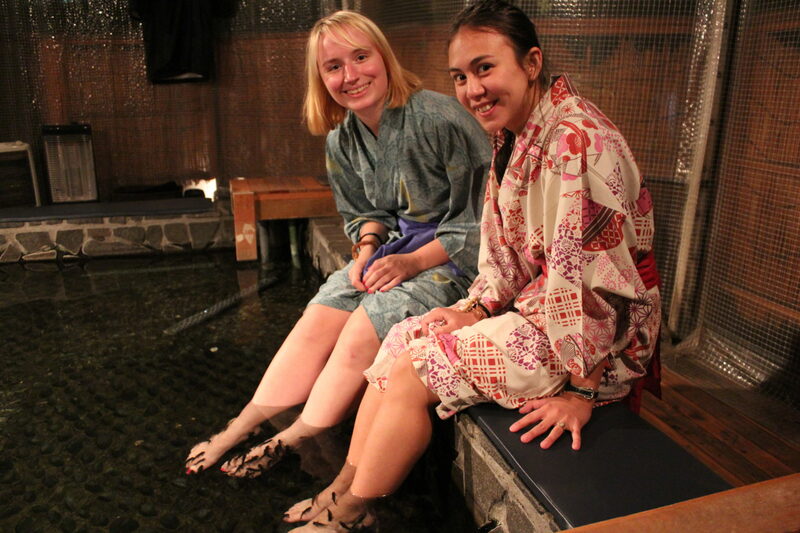 Amelia and Kat went on a trip later in the afternoon and early evening to an onsen, where Amelia presented Kat with a birthday gift: Doctor fish! Also known as garra rufa, these fish nibble at dead skin cells and so have found a place as an unusually carnivorous spa treatment. You may recall that Amelia had previously tried to treat Kat to these delightful flesh-eaters, without success. This time, however, she would not be denied. Eaten alive, and at such a young age. So tragic. By all accounts, the ladies had a very relaxing evening. I did too, albeit from the comfort of my bed. I had planned on going out on the town and seeing the sights (Tokyo Tower was not far away!). However, my bed was so comfortable and my body so tired that I elected to stay in bed and write blog posts all day (though, obviously, not this one — I was running a little behind schedule). Kat and Amelia returned and began assembling costumes for the evening’s festivities. Amelia had initially planned on going as Shana, an anime character from one of her favoured shows. There had been some challenges in locating an appropriate wig and outfit, though, so she made do as a detective. Kat, on the other hand, figured it would be easiest to just go as herself. I mean, seriously, she could have mixed it up a little. Once the ladies were ready, they headed off to a huge Halloween birthday party in Ageha (I think the party in question was called Monster, but don’t quote me — there are a lot of parties). I stayed behind — I was not ready to leave my bed yet, and would not be for another twelve hours or so. It’s OK, I was with them in spirit. Amelia conducted reconnaissance work with her point-and-shoot camera; the sophisticated camera gear stayed back in the relative safety of the hostel with me. Basically a regular day on the Tokyo metro. Behold: a dance floor, totally unlike every other dance floor that you have ever seen. I’m not sure why Captain Jack Sparrow is sporting a bindi, but OK.
I’m not sure why Amelia took a photo of this wall. I guess the tile is nice? It turns out that Tokyo, like many parts of Japan, has a significant population of American military personnel. This can probably be attributed to the large concentration of American military bases in Japan, but then again I’m no sociologist, so who knows? The party (allegedly — this is all second-hand from Amelia, who is notoriously unreliable) was pretty well-balanced between American GIs and Japanese folks (who may very well also be GIs, I suppose). Amelia and Kat became fast friends with a group of seamen (which I assume is what you call American navy… people? ), namely Rob, Dallas, and another guy whose name Amelia forgets. That last part is very embarrassing for her, since she hung out with these guys for roughly 8 hours. (After some Facebook research, she tells me that (a) his name was Adam, and (b) he came as Batman. I assume that she is confusing him with Adam West, beloved actor and Family Guy guest-star). The guys were big fans of video games and junk food, passions shared by Amelia. She ended up grabbing a late-night burger and missing the last train, so they hung out ’till 6am when the trains started running again. Kat was a little more eager to get to bed, and managed to hop on a train before service ended. The fellows were gentlemen, escorting Amelia back to her metro station to ensure she got home safely. It turned out that one of the guys, Rob, was staying near us. We met up in the morning before heading off to our flight. Rob seemed like a nice guy. We hightailed it from the hostel to the airport. I was very excited to be catching a plane back to Hong Kong — although Japan had been lovely, it would be nice to stay in one place for a few days. Amelia and Kat had a more immediate desire for rest, and were hopeful for a chance to stay in the same place for even a few minutes, as soon as possible. Their prayers were answered in the fashion to which the universe is accustomed, which is to say that our plane was delayed and we ended up having to sit with our luggage for a few hours while the tickets got sorted out. The floor was not a great place to nap, or so they tell me, but so I guess this an example of how one should be careful what one wishes for. I was frustratingly, enragingly chipper. 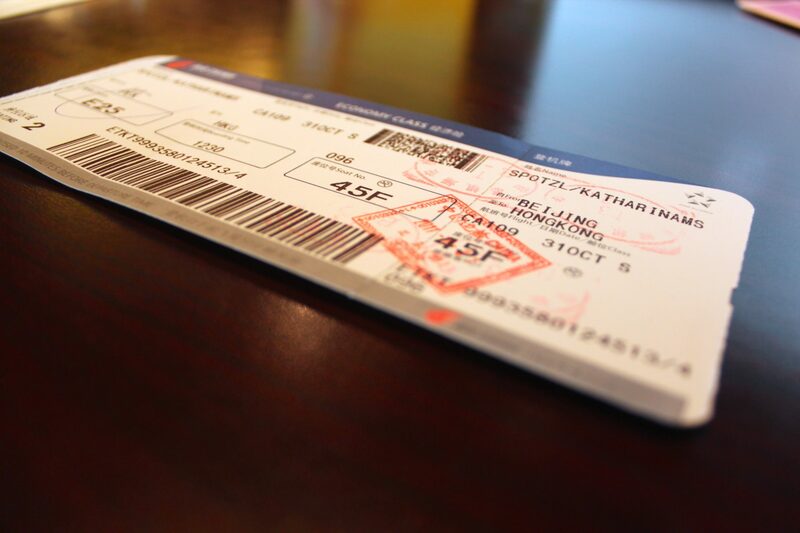 We did eventually get onto a flight with a stopover in Beijing. That stopover ended up being a little more involved than planned, since heavy fog prevented our connecting flight from leaving until the following day. We had to clear customs to stay in mainland China — we got special 24-hour visas and everything, though we were advised that our visas did not entitle us to leave our hotel. Not that we could have if we’d tried; our hotel was a massive, cavernous complex with a staggering number of rooms. Its sheer scope was only matched in degree by the unappealing nature of its buffet breakfast, which haunts me to this day. Fortunately, our connecting flight was not further delayed, and we were soon on our way home. We had nothing planned for weeks after our return, and we could not have been more excited. 30 March 2015 20 April 2015 Christopher ScottComments are off for this post.